If you are on a quick holiday in the Eternal City and want to visit Rome’s most popular attractions in only 2 days, we recommend following our itinerary. You’ll gain insight into this charming and exciting city. What you’ll see will certainly convince you to return for a longer trip! The Basilica of St. Peter, step one of our Visiting Rome in 2 Days itinerary. Get off the metro at the Ottaviano San Pietro stop and walk straight to St. Peter’s square. We recommend getting there early in the morning, before hordes of visitors arrive. 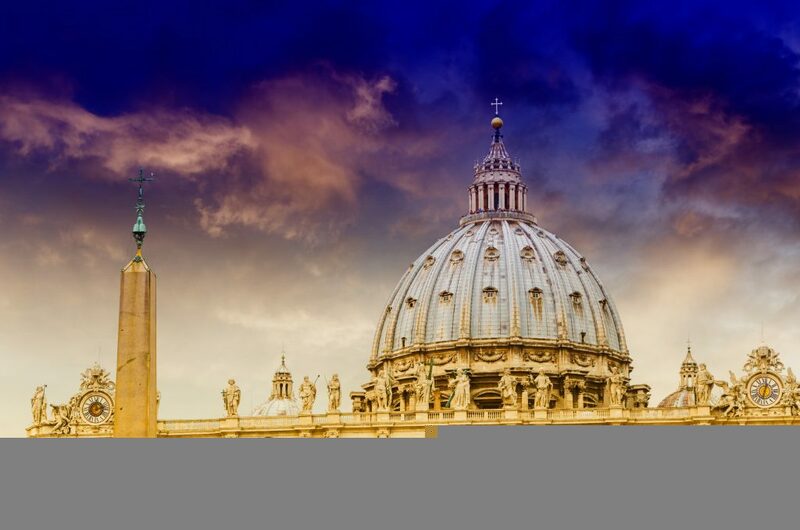 At St Peter’s Basilica, you will be thrilled by one of the world’s largest public spaces. Its majesty and the decorations and works of art it contains will amaze you. Bernini’s baldachin on the Papal altar, and the immense dome, are both astonishing. Take some time to admire the Pietà, the touching work of Michelangelo, which is located in a chapel behind bulletproof glass at the beginning of the right nave. Sculpted by the artist when he was only 25 years old, it’s the only work of art that bears his signature (look closely across Mary’s chest). Remember to wear proper clothing or you will not be permitted to enter: no miniskirts, shorts, or bare shoulders. If you have some spare time, climb the 551 steps that lead to the top of the dome, or take the elevator to reach the terrace. From there, you must climb another 360 steps to the top, but you will be rewarded with an amazing 360° view of Rome. After leaving San Pietro, take some time to rest at the square and snap a few souvenir pictures, then head to the Vatican Museums located nearby. We suggest buying your tickets online to avoid the entrance queue. The museums are huge; for a general tour, we recommend visiting the picture gallery, the Pio-Clementino Museum, the Gallery of Geographical Maps, Raphael’s rooms, and of course the amazing Sistine Chapel containing precious frescoes painted by Michelangelo (here to ensure your priority) . Keep in mind that you will spend at least 2 full hours in the Museum. Once your tour of the museum is over, walk across Via della Conciliazione up to Castel Sant’Angelo for an external view. If you aren’t tired yet, you can go ahead and visit it from the inside (If you buy the online ticket will be able to jump the queue ). Be sure to stop at the terrace to enjoy an exceptional view of the city. Next, take a break for lunch. Avoid the pizzerias and restaurants surrounding the Vatican, where they won’t hesitate to serve you very cheap food at extremely expensive prices. After enjoying a refreshing meal and some rest, our itinerary for visiting Rome in 2 days continues through Ponte Sant’Angelo. 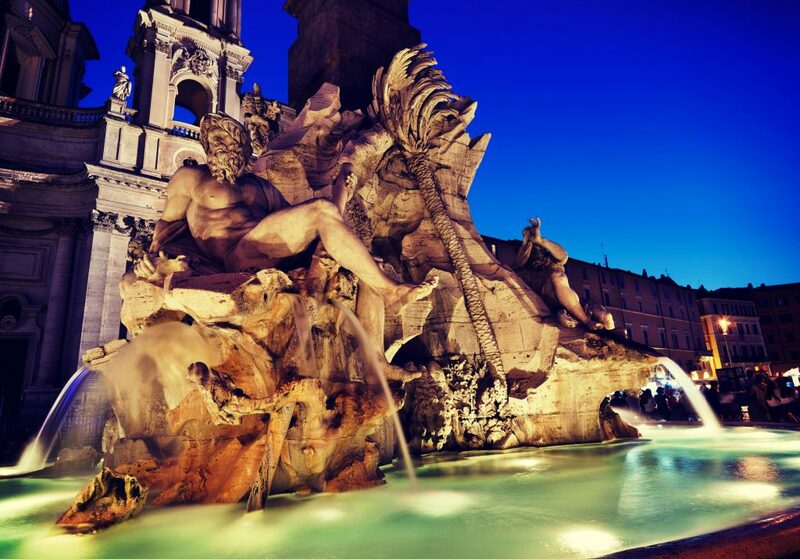 Keep walking until you reach Piazza Navona, with its beautiful baroque palaces and magnificent fountains (including the Four Rivers Fountain of Bernini). Lose yourself in the crowds of tourists, portrait artists, and street performers that fill the square 24 hours a day. From Piazza Navona, cross Corso Rinascimento and continue behind Palazzo Madama (house of the Senate) along the narrow streets that lead to Piazza della Rotonda and the Pantheon. The Pantheon is one of the many symbols of Rome, and the best-preserved historical monument in the city. Upon entering, you will be overwhelmed by the magnificent marble interior and the stunning view of the world’s largest unreinforced concrete dome. After leaving the Pantheon, head back to Piazza Della Rotonda. From there, take Via Pastini up to the Temple of Hadrian. Walk past it; continue on Via di Pietra, cross Via del Corso and onto Via delle Muratte. Follow the sound of flowing water up to the Fontana di Trevi. The view of this fountain will truly leave you breathless. You will be completely captivated by Rome’s must-see attraction. After stopping here for photos, head on to Via della Stamperia up to Via del Tritone. Cross it and head down Via Due Marcelli. You will arrive at the famous Spanish Steps, which have recently returned to their former glory, thanks to a new restoration. The Spanish Steps are a stairway connecting the elegant eighteenth-century Piazza di Spagna to the Trinità dei Monti, at the foot of which lays the famous Fontana della Barcaccia. End the evening with dinner at one of the many restaurants in the area. The second day of our visiting Rome in 2 days itinerary will guide you as you discover ancient Rome. 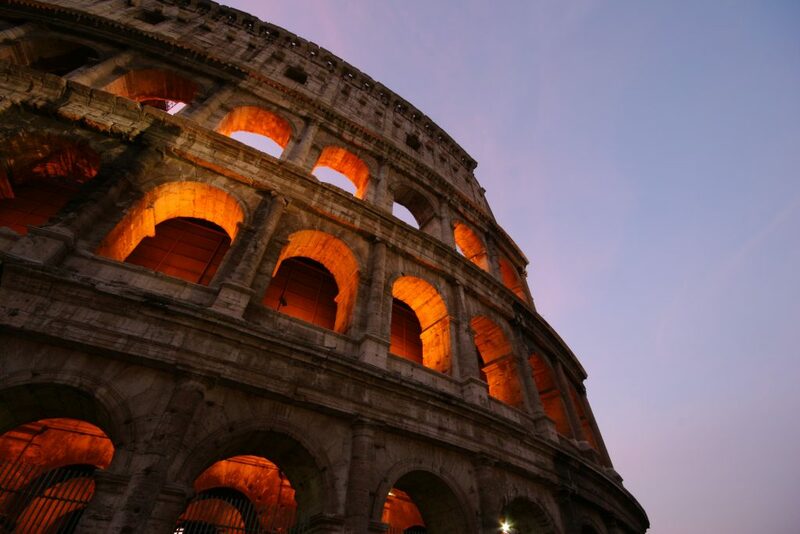 The itinerary begins from the Colosseo (Colosseum) (metro stop: Colosseo), quintessential symbol of the Eternal City. We recommend starting your tour early in the morning to avoid the hot, sunny hours and crowds of visitors. Bring bottles of water and something to eat so you won’t spend a fortune at bars or at the food trucks parked in Via dei Fori Imperiali. If you want to visit Rome in 2 days do not miss the Colosseo. If you plan to visit the inside of the Colosseo, buy the ticket online and you can skip the long queue at the entrance. Not far from the Colosseo is the Arco di Constantino (Arch of Constantine), the most famous Roman triumphal arch and one of the last monuments of ancient Rome, and further ahead is the Palatino. Take a walk along Via dei Fori Imperiali, all the way to the Foro Romano (Roman Forum), on your left. This used to be the heart of Rome. The Fori Imperiali (Imperial Fora) is an archaeological complex extending along the road and contains ancient forums built by various emperors from 42 to 112 BC. You can admire the forums along Via Alessandrina right up to the majestic Colonna di Traiano. Here you can appreciate the wonderful bas-reliefs, carved into stone in a comic strip way, narrating the emperor’s war against Dacia. You won’t find many restaurants or bars along the way, so we suggest bringing your lunch bag with you and stopping at the Colonna di Traiano to eat something. After lunch, leave the Foro di Trajano and head to Piazza Venezia, towered on one side by the enormous Vittoriano Monument. This building today is dedicated to the Unknown Soldier and was built in 1885 to honor the unification of Italy. Please note that there are strict controls here and sitting down is forbidden. You can reach the top of the Vittoriano in the panoramic glass elevator on the side of the building. Once you reach the terrace, the view is priceless. Our itinerary to visit Rome in 2 days ends at the Campidoglio (Capitoline Hill), the most famous and smallest hill in Rome. You can reach it by climbing the Cordonata (it’s the most spectacular way to get there), a stairway from Piazza d’Aracoeli to piazza del Campidoglio, designed by Michelangelo. Here you can admire a perfect replica of the equestrian statue of Marcus Aurelius. The original is displayed in the Capitolini Museums (equipped for the disabled) located on the right side of the square. The Capitolini Museums are the oldest public museum in the world and are well worth a visit. If you have enough time, we recommend spending a couple of hours here. Make sure you don’t miss the Pinacoteca and its paintings of Titian, Tintoretto, Rubens, Van Dyck and many other great artists, as well as the Lupa Capitolina, the Galata Morente and the Venere Capitolina. The museums are included in the Omnia Card. Our itinerary for visiting Rome in 2 days is a general guideline and can be challenging for many. You can choose to follow each step as it is or simply skip a few based on your personal interests, on the time you want to spend at each individual attraction and on how much you’re willing to walk! Vatican Museums: from Monday to Saturday, 9.00 am – 6.00 pm (last entry is at 4.00 pm and exit is half an hour before closing). Basilica di San Pietro: 1 October – 31 March, every day, 7.00 am – 6.30 pm / 1 April – 30 September, every day, 7.00 am – 7.00 pm. Free entrance. Castel Sant’Angelo: every day from 9.00 am to 7.30 pm (ticket office closes at 6.30 pm). Full price €10, reduced price €5. Included the Omnia Card. Capitoline Museums: every day from 9.30 am to 7.30 pm, 24 and 31 December from 9.30 am to 2.00 pm. The ticket office closes one hour earlier. Closed on 1 January, 1 May and 31 December. Full price €14, reduced price €12. Included in the Omnia Card.